Submitted by maki on 2013-04-03 12:55. Ah sauces, the best part of cooking ! I really liked you article! I just tried my hand on a nanban sauce last week but I was unsure about what type of vinegar to use, this clears things up ! You talk about personal preferences, what about yours ? I really like ponzu the best I think followed by nanban-su, but I like all of them. thanks for this lesson! I learned a lot and I am looking forward to making some great side dishes! I've made pickles with recipes from your website with veggies such as cucumbers, fennel and napa cabbage. 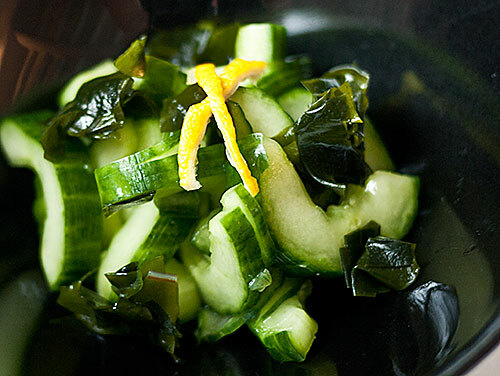 What other veggies pair well with the sunomono method of preparation, both traditional and western? Thank you so much for posting these! I love sunomono, and now I finally know the meaning of the soy sauce I've got too (the names get confusing @_@). I will definitely use this a lot! I learned a lot from this post. Sincere thanks. Learned a lot with this post. Sincere thanks. You mentioned in Sainbai-zu(三杯酢)with "3 parts" rice vinegar, but in the example you put: "e.g. 2 tablespoons rice vinegar." I am not sure which one is a typo. By the way, this is another great lesson!! Thank you Maki. This is very useful. Because of blood pressure concerns, I am limited (unless I cheat :) in my salt intake. I use very little salt, and I love soy sauce, but I keep the amounts minimal. Are there any ways to get the same flavor (or close enough) while minimizing salt and soy sauce? Well...one way to lower your sodium intake while upping flavor is to use dashi, or some kind of glutamates, which often means MSG. Which is what a lot of food manufacturers do - not just in Japan either. (There seems to be some evidence that the number of people who are sensitive to glutamates is pretty low, but that's beyond the scope of this comment really.) There are low-sodium soy sauces too. Another way to reduce sodium intake is to use more vinegar and/or citrus - although this means retraining your tastebuds to appreciate sour tastes more. High blood pressure is a problem for some Japanese people, although it looks like keeping weight down and controlling the other adult-onset problem signs like cholesterol, triglycerides, blood sugar, etc. are just as important. Also keep in mind that these rather salty foods are eaten in small amounts as part of a whole meal. I am not sure I understand the 'Make ahead' part correctly. Is it correct that with citrus or dashi it keeps for a couple of weeks but without it it doesn't?